Being a second year trainee teacher from the University of Worcester has given Taylor, our education blogger, an unparalleled insight into the latest methods of teaching. In this wonderful and timely blog entry Taylor discusses which 3 Apps she has been introduced to on her course and how they can be incorporated into the classroom. Welcome to the Technology Age! Whether you regard yourself as ‘tech-savvy’ or not, there is no denying that we are experiencing the technology movement, and living in the technology age. We are surrounded by TVs, computers, phones and tablets, and so are most children, so it would be a shame to neglect such devices in the classroom and stick to a textbook way of teaching rather than exploring the many uses that technology can offer us as professionals. I have been in many schools either on work experience or placement, and I have observed the range of technological devices dispersed throughout the school, so the worst case scenario I could think of would be for them to not be used! In this post I am going to share with you some of my favourite apps that I was introduced to in my Computing module, what they do, and how I think they can engage pupils. The three apps I am going to discuss are available on the AppStore on Apple devices, and I have used them on my iPad. Book creator is an app that pretty much does what it says on the tin. It allows children to create their own stories, and be as creative as they wish. The interface is very user-friendly, and there are tutorials to help new users of the app. Children are able to change the colour of the background, input text with a font of their choice, and even add photos and videos to bring the book to life! I think that this app has so much potential within the classroom, and the opportunities for assessment are not only computing-based, but heavily focused around literacy and a child’s understanding of whatever task you set them. Inspiration is an interactive mind-mapping app. The interface is again, very friendly, and the children can select from a range of templates and then input their own information. I feel that this app would be very useful for collating information and ideas quickly as the children do not have to spend a long period of time drawing the mind-map and the extensions coming off it – this is easily achieved by a click of a button. It is useful across curriculums as the templates are for different subjects, and the designs are catered for different topics within that subject. Showbie is a slightly different app in that it is a quick and efficient way for teachers to collect any work created on a device like an iPad or computer digitally. This is particularly useful if you teach at an eco-school where unnecessarily printing is frowned upon, and for assessment purposes, this app is great at minimising pointless bits of paper that stay on a pile on your desk for weeks before being moved to the recycle bin. You can set up your classes or groups, and by the click of a button the children can upload the work that they have done into the folder – it’s as simple as that! 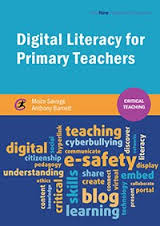 Our book ‘Digital Literacy for Primary Teachers‘ by Moira Savage is a fantastic text goes into more detail about the importance of being digitally literate. Keep up to date with more of Taylor’s posts by subscribing to our blog, following us on Twitter and liking our Facebook or Instagram page. Everything in this world is now digitalised. E-mails have replaced letters, the cloud has replaced filing cabinets and my phone is my notebook, my calendar and my calculator! It is absolutely vital that children are in tune with this new and exciting digital age and therefore teachers also need to develop ‘digital wisdom’. Moira Savage and Anthony Barnett, authors of our book ‘Digital Literacy for Primary Teachers’ have prepared an exclusive entry about the importance of digital literacy in primary education. Why not have a quick read in your lunchbreak!? Digital wisdom, fluency, capability or literacy? You will likely encounter a range of terms used in discussions and reading about the topic, that it can appear baffling. However, what is more important are the definitions given for these words and here the consensus begins to bring us towards a shared understanding of what we are discussing. Is digital literacy more than a list of technical competencies to train teachers and children in? We would argue strongly that it is much, much more! It is a way of being and acting in our modern digital world. Firstly, should we be discussing digital literacy or literacies? Is the interpretation of digital literacy static or evolving; is it context specific? Are certain values, attitudes and dispositions involved? Are we talking about activities that only involve consuming digital content or those where we produce and create digital content? Belshaw, (2013) states that ‘digital literacies are plural, subjective and highly context dependent’. “Computing also ensures that pupils become digitally literate – able to use, and express themselves and develop their ideas through, information and communication technology – at a level suitable for the future workplace and as active participants in a digital world” (DfE 2013). ‘Digital Literacy for Primary Teachers’ gives a comprehensive and practical overview of what this means for today’s teachers and learners. Readers are encouraged to reflect on their own digital literacy in order to enhance their professional teaching practice. Major topics and themes are explored in a practical way to provide ideas to support teaching and learning founded on established pedagogic principles. National curriculum links and Teachers’ Standards are identified and readers are challenged by critical questions as well as being offered suggestions for further reading and useful resources. Chapter maps provide a visual overview of topics covered in each chapter. Highlights from the chapter on digital teaching include extensions to Shulman’s model of teacher knowledge to incorporate a focus on digital technology and a focus on digital technology tools. Affordances of technology are explained so that teachers can start to think about to make the most of digital technology when teaching. The chapter on digital learning considers theoretical models related to multimodal learning, memory and motivation. Well known sources are referred in the context of digital literacy e.g. Moreno & Meyer’s model of the memory; Dweck’s concepts of performance and learning goals; and Malone and Lepper’s taxonomy of intrinsic motivations. Information literacy is often associated with digital literacy and this important theme is explored in detail with a particular focus on search techniques and approaches for critically evaluating information. Managing file formats is also considered including ideas for pupil activities. The affordances of a networked world include new possibilities for collaboration and communication. Examples are provided of teachers and learners using web 2.0 tools such as wikis, blogs and podcasting. The book also includes a chapter exploring the various dimensions of digital citizenship including netiquette, digital commerce, data protection and security, copyright and digital access. Throughout the book readers are prompted to reflect further by case studies and are able to consolidate their developing knowledge by referring to the summaries of critical points at the end of each chapter. Two chapters towards the end of the book directly address the areas that often worry teachers the most; ‘digital identity and footprints of teachers’ and the complementary ‘e-safety and digital safeguarding’ of children. These chapters reflect best practice in the sector, avoid alarmist claims and offer sensible and practical steps to make the most of the exciting networked world that we live in. For both teachers and children the emphasis is on empowerment through education to inform personal and collective decisions relating to online action and real-world consequences. An extremely topical book with some exciting tips and advice, for more information please see our website.